Pg 70 Chicken, Celery and Black Pepper Stir Fry. Just tussled this up for my hungry teenagers. Quick and easy- quite hot too ....a big pepper hit! I added a sliced red capsicum as I had one that needed using up. Served with very thin organic noodles that I found in my pantry rather than rice as suggested . This was a request of my eldest son. It is not a stir fry that has sauce- quite dry but tasty nonetheless. I was missing some of the ingredients so ended up with 3 cups of cooked brown rice, 2 fried/chopped mushrooms, 3 stalks of thyme, 1/3 cup of toasted sunflower seeds, 1/3 cup currents, 1/2 tsp sumac and 1/3 of a packet of feta. Yum! I love the basic concept of this salad and the various ingredients worked really well together. Needed more flavouring though - more spice quantities and I think it would be great to toast and freshly grind the fennel and cumin first for even more flavour. A very simple, quick lunchtime recipe with light, spring-like flavours. Loved the creamy pockets of ricotta. Think we could have done this in a pan and it would be less fiddly with the same result. Suggest adding a bit of sweet chilli sauce / chilli jam. Not bad, but not a lot of depth of flavour. The flavours are delicious. I made a variation by using the tahini mixture as a dressing for the roast carrots and chickpeas. It worked well. Delicious- very very moreish - I have made these before just using sea salt and oil but these were much better! O.k, but nothing special. Have had better "healthy" cakes than this one. While the recipe themes may be familiar, Hay's instructions are unmatched in their simplicity, and she has great suggestions for creating lighter versions of standbys. 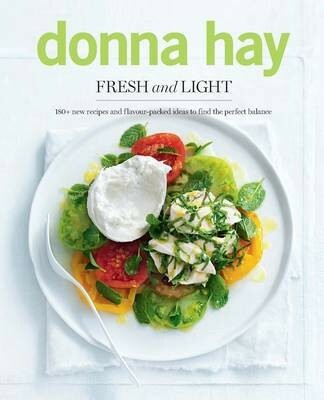 Fresh and Light is Donna Hay's answer to finding the perfect balance. Designed to complement her hugely popular, existing repertoire, it is full of new recipes that combine fresh and flavoursome ingredients. Ditch the diet and find the balance - Fresh and Light is mindful of fat and carbohydrates, but focuses on flavour and variety, without the guilt. With chapters divided by meals, Fresh and Light offers a multitude of recipes for those times when you're seeking something a little more virtuous. Start your day the right way with five-grain porridge or asparagus, tomato and feta egg-white omelette. Store up an array of go-to recipes for fast but healthy weekday dinners such as lemon and goat's cheese roasted chicken, red quinoa, kale and haloumi salad or thai green curry chicken skewers. Treat yourself but feel a little more innocent doing it with Donna's chocolate, pistachio and almond biscotti or berry and ricotta slice. Donna shares her fool-proof recipes for light breakfasts, tasty lunch tips and fast dinner solutions to give you ideas for every time of the day. This book is the answer to that constant juggle for the perfect balance, with a focus on ease and flavour, but always leaving room for the little indulgences in life.